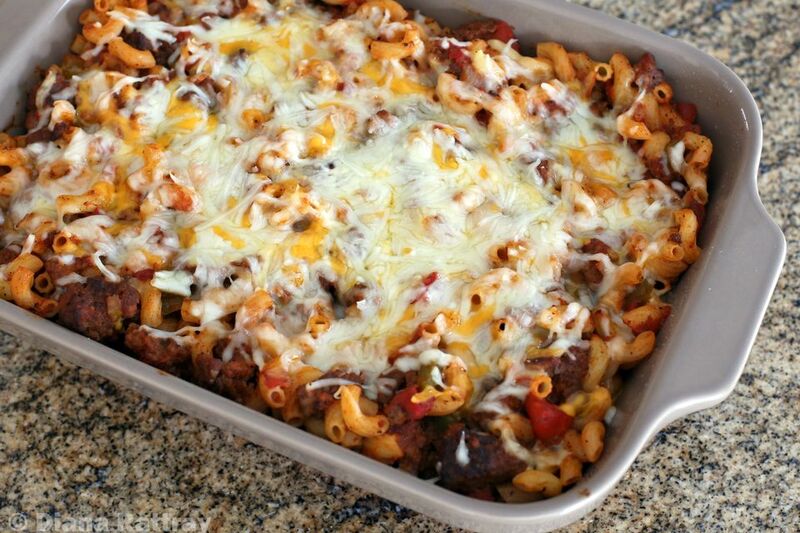 This casserole combines familiar, comforting American chop suey with a melty cheese topping. This is a delicious way to enjoy classic American comfort food, and it can even be prepared a day in advance. Use a cheddar jack blend of cheeses or a blend of cheddar and mozzarella, or use a shredded Mexican blend (unseasoned). Any good melting cheese would be great on this casserole. You could also skip the baking step and serve it immediately. Serve the dish with a tossed salad and crusty bread or garlic bread. Lightly butter a 2 1/2- to 3-quart baking dish or spray it with nonstick cooking spray. Bring a large saucepan of salted water to a boil over high heat. Add the macaroni and cook following the package directions. Drain well and set aside. Heat the olive oil in a large skillet over medium heat. When the oil is hot add the ground beef, onion, and bell pepper. Cook until the onion is tender and the beef is no longer pink, stirring frequently. Add the tomatoes, tomato sauce, garlic powder, sugar, paprika, and bay leaf. Taste and add kosher salt and freshly ground black pepper, as needed. Bring the sauce to a simmer. Reduce the heat and simmer for about 15 to 20 minutes. Remove the bay leaf and combine the sauce with the drained macaroni. Mix thoroughly. Transfer the American chop suey mixture to the prepared baking dish. Sprinkle the shredded cheese over the casserole. Bake for 20 to 25 minutes, or until the casserole is hot and cheese has melted. Add 1 small can or jar of sliced mushrooms (drained), or saute about 8 ounces of fresh sliced mushrooms in 1 tablespoon of butter and add them to the sauce mixture. Use 2 cloves of fresh minced garlic instead of garlic powder. Add the garlic to the skillet with the ground beef about 2 minutes before the beef is done. Make-ahead instructions: Combine the sauce and macaroni; transfer to the baking dish. Cover the baking dish with foil and refrigerate until about 20 minutes before you plan to bake it. Remove the casserole from the refrigerator and let it stand for about 20 minutes. Bake in the preheated oven for 20 minutes. Top with the cheese, return to the oven, and continue baking for about 15 minutes, or until the casserole is hot and the cheese has melted.